Form 15G and Form 15H are forms which can help a person avoid TDS in case one does not have to pay income tax at the end of the year. Form 15H is for senior citizens and form 15G is for others. In this article we will see how a person can avoid payment of TDS by submitting these forms 15G and 15H. The conditions under which Form 15G and 15H may be filed are similar yet with a significant difference. Each taxpayer needs to fully understand the specified conditions and ascertain whether he or she is eligible for filing the relevant form. Filing the form without being eligible to do so is illegal and will invite payment of interest on the tax payable and also a penalty. This article is about explaining the difference. If you believe that your total interest income for the year will not fall within overall taxable limits, you should inform the Bank not to deduct TDS on deposits. You can do this by submitting a form as per the provisions of the Section 197A of Income Tax Act. The Finance Act, 1982 has inserted a new section 197A with effect from June 1, 1982. The section enables an individual who is resident in India and whose estimated total income of the previous year is less than the minimum liable to income-tax to receive interest on securities, dividends and other interest without deduction of tax at source under sections 193, 194 and 194A of the Act on furnishing a declaration, in duplicate, in the prescribed form and verified in the prescribed manner. Rule 29C and Form Nos. 15F, 15G and 15H have been inserted in the Income-tax Rules, 1962 by the Income-tax (Fifth Amendment) Rules, 1982 prescribing the forms for the purposes of section 197A and laying down the procedure for furnishing the declaration form. Fresh forms are required to be filed each year. As incomes of investors may differ from year to year, the eligibility for furnishing the forms has to be ascertained every year. Secondly, for optimum benefit, these forms need to be furnished at the beginning of the fiscal such that the entire amount of interest escapes TDS. If the form is filed during the year, the tax already deducted cannot be adjusted against future tax deductions. This form should be submitted to all the deductors to whom you advanced a loan. For example you have deposit in three SBI bank branches with interest of or more Rs.10,000 each. You must submit the forms to each branch. You need to submit forms if interest on loan ,advance, debentures, bonds or say Interest income other than interest on bank exceeds Rs 10000.
Who is of the age of 60 years or more claiming certain receipts without deduction of tax. Estimated tax for the previous assessment year should be nil. That means he did not pay any tax for the previous year because his income is not coming under the taxable limit. Form 15G: Declaration under sub-sections (1) and (1A) of section 197A of the Income-tax Act, 1961, to be made by an individual or a person (not being a company or a firm) claiming certain receipts without deduction of tax of tax. Form 15G can be submitted by Individual below the age of 60 years. The final tax on his estimated total income computed as per the provisions of the Income Tax Act should be nil. To further understand these provisions, let’s take the example of Mr Shah, who is 55 years old. Shah’s total income is Rs 2,90,000, of which Rs 2,10,000 is earned by way of interest from bank deposits. Shah also invests Rs. 1,00,000 under Section 80C and pays a medical insurance premium of Rs 15,000. Is Shah eligible to furnish Form 15G? The first condition is that Shah’s final tax liability should be nil. Though Shah’s gross income is Rs 2,90,000 lakh, on account of his Section 80C and Section 80D deductions of Rs 1,00,000 and Rs 15,000 respectively, the net income falls to Rs 1,75,000 lakh and consequently he is not liable to pay any tax. Therefore, Shah satisfies the first condition. However, we find that since his interest income of Rs 2,10,000 is more than the basic exemption limit of Rs 2,00,000. Shah does not satisfy the second condition and hence he is not eligible to furnish Form 15G to the interest paying organisation. On the other hand Form 15H imposes just the first condition, in that, the final tax on the investor’s estimated total income computed as per the provisions of the Income Tax Act should be nil. The second condition imposed by Form 15G is not applicable in the case of Form 15H. For example, say Mr. Mehta, 68 years old, has a total income of Rs 3,00,000, out of which Rs 45,000 is earned from the senior citizens saving scheme and the rest from bank deposits. He invests Rs 50,000 in PPF. Now, is he eligible to furnish Form 15H? As pointed out earlier, all Mehta has to do is to ascertain his final tax liability. It doesn’t matter what amount he receives from which source; this information is irrelevant for Form 15H. We find that Mehta’s net income works out to Rs2,50,000 (Rs3,00,000 – Rs50,000). As the basic exemption limit for Mehta is also Rs2,50,000 (on account of him being a senior citizen), his net tax liability is nil and hence he is indeed eligible to submit Form 15H. Form 15G is meant for non-senior citizens whereas Form 15H is meant for senior citizens only. The aggregate of the interest etc. received during the financial year should not exceed the basic exemption slab for Form 15G while no such condition exists for Form 15H. in any other case, with rigorous imprisionment which shall not be less than three months but which may extend upto three years and with fine. Only persons with income below taxable limits and Nil Tax liability can only make use of this form. Once declaration is given in Form 15G/Form 15H, there is no need to declare this income in return of Income. Irrespective of the fact whether the Form is used or not, the respective income should be compulsorily declared in return of income. Once declaration is given in Form 15G/Form 15H, there is no need to pay tax on the same. As per the provisions, only persons with NIL tax liability only can give these forms. But if there is a tax liability, they have to necessarily pay the requisite tax. On the other hand, by payment of tax they run the risk of giving a wrong declaration. Hence before giving Form 15G/15H, please be doubly careful. Form 15G 15H are submitted only to the banks/Financial Institutions/Payer. This is partly correct. The person who receives the Form 15G/15H is required to submit one copy of the Form to the Commissioner of Income-tax . Hence the information is passed on the Income-tax department and the Income-tax Department can make further enquiries on the same. Submission of Form 15G/15H once is sufficient. No. These forms shall be submitted every Financial year at the beginning of the Financial year. It is enough that irrespective of the fact that deposits are held in different branches, a single Form is sufficient. No. These forms should be submitted to each and every branch where you hold the deposits. For example, if you hold deposits in 3 different branches of State Bank ofIndia, this declaration shall be given for each branch separately. These forms can be used only for payments in the nature of Interest of Securities, Dividend, Interest other than Interest on Securities (Bank/Company Deposits) , NSS Interest on Units. For other types of payments, these forms cannot be used. 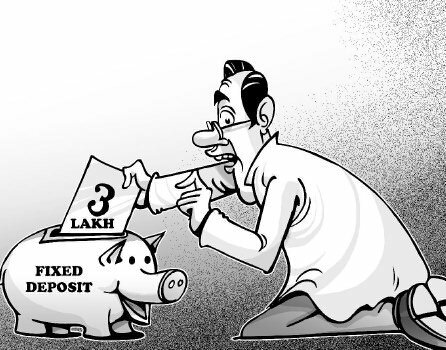 How to Save TDS on Fixed Deposit Interest? suppose a person submitted form 15G to avoid TDS on his interest income with his PAN. After that, he got some Income from Gift (OR) from any other sources which he is not aware of. what he can do in this respect ?? The person/assessee in the question will be liable to pay interest on the amount to which should have been deducted if he had not furnished the form and penalty. Under what sec you are referring, In this case he is not trying to avade the tax, penalty should be imposed only when there is intentional tax evasion. in any other case, with rigorous imprisonment which shall not be less than three months but which may extend upto three years and with fine.